Markets struggled yesterday to find clear meaning in all the news lately and prices subsequently remained roughly flat throughout the day. After a small early morning dip, prices trotted higher again to close just 15 cents above Friday’s close. This morning, crude oil remains at $68.94, rising a small 7 cents since yesterday. Markets were a bit more confident about fuel prices, hoping that demand would show one last summer-time push higher this week before we reach September. Both gasoline and diesel prices picked up more than a penny yesterday. Today’s prices are continuing to rise ab it. Diesel prices are currently $2.2288, gaining 1.4 cents. Gasoline is at $2.0965, picking up a smaller 0.7 cents. The big news from yesterday was the announcement of a bilateral free trade agreement with Mexico, which Trump claimed would replace the North America Free Trade Agreement. The S&P 500 reached record levels in response to the news. Ending NAFTA has been a rallying cry for Trump since his campaign, and it looks like the early results are positive. Officials hinted that a similar deal could be struck with Canada at some point in the future, though in the meantime Trump continues to threaten them with tariffs. Of course, the prospect of increased trade and stronger economic activity likely foreshadows rising oil demand and higher prices. Additionally, the trade agreement clearly demonstrates that Trump can strike a free trade deal – which likely means all the China antics are in pursuit of a true deal. As America once again signals that it’s safe to do business internationally, the dollar has been taking a hit. Investors feel safer moving from the USD to other currencies, causing other currencies to appreciate. That’s not a bad thing for the US – a weaker dollar makes our goods cheaper for international consumers, driving exports (and economic growth) higher. 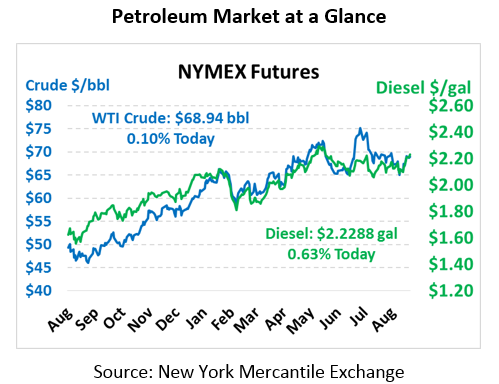 On the flip side, a weaker dollar pushes up oil prices, which can put pressure on consumers. Hurricane Lane tore through the Hawaiian Islands over the weekend, bringing 52-inches of rain – second only to Hurricane Harvey in US rainfall records. Flash flood warnings have been issued through today, and many on the islands are without power. Fueling in Hawaii presents a unique challenge for suppliers. The islands have two refineries, one of which announced shutting down on Friday during the storm. Fuel is distributed by barge from the two refineries in Oahu, and sources claimed that fueling continued through Friday to ensure sufficient coverage of the islands. Still, many retail stations shut down during the storm due to unsafe conditions. Par Pacific, which shut down on Friday, resumed operations on Sunday and said it would begin making deliveries as soon as it’s safe.